Over the holiday season a new Transformer movie appeared. There’s something engaging about the concept of transforming from one concept or shape to another. In education transformations are also quite engaging and worth investigating. This past semester I coordinated two Design Challenges for the Energy Innovation Center in Pittsburgh with schools from the Parkway West Consortium of Schools. Each Design Challenge required the student consultants to think out of the box and come up with a transformative set of ideas. Student teams from Parkway West, Quaker Valley, and Keystone Oaks tackled the transformative challenge of “Rebranding Careers.” How do we rethink the language and images to describe technical workers? How do we change the perceptions of students and parents regarding the value of alternative choices to a college program? The student consultants developed a website with a marketing campaign, an app, and a video to address the transformative questions. It was fascinating to watch the student consulting teams go through their own transformations. The student teams had to learn to work with not only their own team members, but with fellow consultants from other schools. The design process of moving from a set of questions to a solution requires an ability to listen to a client’s needs. For most students this is a transformative challenge. Our traditional school approach is based on a teacher-focused orientation. Students respond to the need of the teacher who, in turn is trying to look at a standard or final outcome that is built into a curriculum. What happens when you transform this process? How do teachers and students handle their roles as facilitators and consultants? For the student teams and teachers it takes time to adjust to this challenge. However, the final product for the Rebranding Careers Design Challenge demonstrated the success for the process. What could have been three individual projects, turned into one website that linked to each of the student consulting teams ideas. The client team from the Energy Innovation Center responded positively to the student products and intends to seek further funding to work on the prototypes shared by the consulting team. The Bedford Facade Design Challenge had similar positive effects based on the student consulting teams’ efforts. In this case teams from South Fayette, Chartiers Valley, and Parkway West collaborated to generate a three-tiered lighting plan for the original entrance of the Energy Innovation Center erected in 1930 as the Connelley Trade School. The Design Challenge process I use enlists the aid of a series of professional experts who work with the student consultants from the kick-off through the final presentation. For this Design Challenge the Energy Innovation Center brought to the table two experts from the Duquesne Light Company of Pittsburgh. The experts explained at the kickoff that consultants often outline different financial packages in their response to a Request for Proposal (RFP). The student consulting teams took this to heart and delivered silver, gold, and platinum options for the Design Challenge. For the student consultants the ability to think about multiple solutions was a transformative moment. In our traditional classes we tend to look for one solution that is already known, but for this Design Challenge the notion that there could be multiple approaches for a problem was quite challenging for the student teams. The client team from the Energy Innovation Center, praised this approach. It met the real needs for the project. Now the Energy Innovation Center has a much better idea on the actual costs and what would be associated with each option. I also wanted the student teams to use a model for the building as part of their presentation. The students don’t usually think about three-dimensional elements to explain an idea. 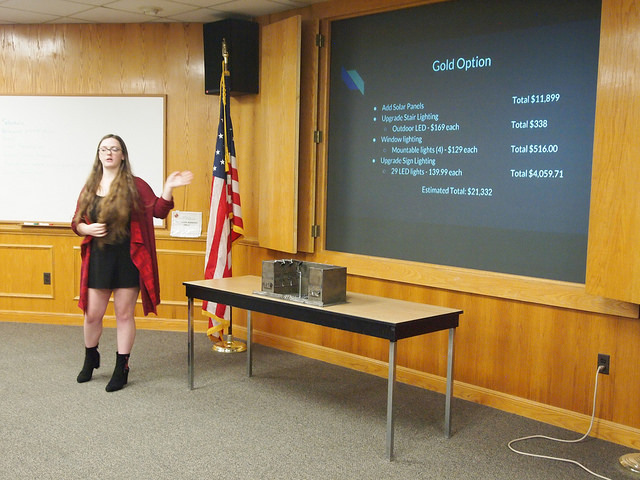 The team of students from Parkway West welded a metal model that became the key for each consultant as they visually explained how each part of the solution would work. For instance, when the student consultants talked about the use of a Lumatrix lighting solution, they were able to point to the model to indicate exactly where the projection system would go. The key to the final success for the Design Challenge will be the actual transformation for the Bedford Avenue facade at the Energy Innovation Center. The student consulting teams outlined a thorough proposal that included CAD drawings, a cost analysis, and a 3-dimensional model for the site. The Energy Innovation Center will now look at opportunities to use the student ideas to transform the building to highlight the rich history of the building and its bright future as a center for sustainability. ← What Happened at #TRETC2018?